Corpectomy is the surgical removal of all or part of the vertebral body, usually in an effort to decompress the spinal cord and nerve roots. It is also used in the correction of spinal deformity (kyphosis and scoliosis). It is most commonly used to treat spinal stenosis and myelopathy of the cervical spine through an anterior approach. After completing a corpectomy the spine is stabilized with structural bone graft spanning the corpectomy defect and anterior spinal instrumentation. Most patients are discharged home within 2-4 days and heal within 6-12 weeks. Who is a candidate for Corpectomy? Corpectomy is performed for patients with a structural lesion (most commonly disc herniations and bony spurs) compressing the spinal cord and nerve roots from the front. Patients usually have radiculopathy (arm pain, numbness tingling, or weakness) or cervical myelopathy (hand and leg weakness and balance problems) that does not improve with non-operative treatment. Patients with neurologic deficit or progressive lesion likely require urgent treatment. Corpectomy is also part of larger procedures to correct spinal deformity (scoliosis, kyphosis, spondylolisthesis) or unstable fractures. Structural bone graft spanning the corpectomy defect and anterior instrumentation is necessary to stabilize the spine and optimize healing potential. Corpectomy usually involves an anterior approach (through the front) to the spine. The muscles and structures are retracted exposing the front of the spine. The discs above and below the vertebral body are removed and then the vertebral body resected with rongeurs. It may be necessary to remove the posterior vertebral wall and posterior ligament to visualize the spinal cord and confirm adequate decompression. The vertebral endplates are decorticated (cartilage removed and bleeding bone exposed for healing) and structural bone graft inserted spanning the defect from the vertebral body above to that below. Anterior plate instrumentation is included to provide additional stabilization and increase healing. Patients usually go home within 2-5 days and heal within 6-8 weeks. Figure 1. Cervical corpectomy with strut graft and anterior instrumentation. 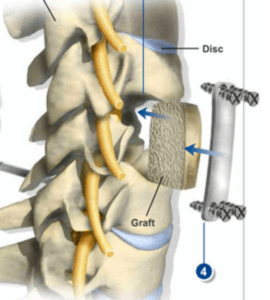 The large corpectomy defect spans the length from the vertebral body above to that below and is filled with strut bone grafting and anterior instrumentation for stability and healing. What are the pros and cons of Corpectomy? Most patients have good to excellent relief of myeloradicular complaints. Surgical risks include but are not limited to infection, neurologic injury, dural tear, failure to heal (non union or pseudo-arthrosis), dysphagia (swallowing difficulties), hoarseness, and chronic pain. Each patient is unique and only a comprehensive evaluation with a fellowship trained spine surgeon can give you the best appreciation of the risks and benefits for surgical treatment of your condition.